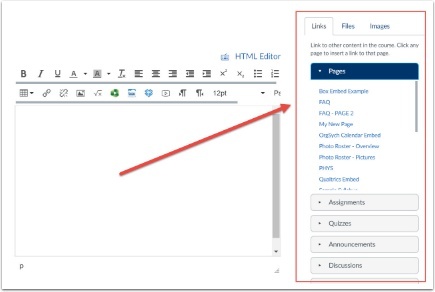 You can insert links to files in your course's Files area by using the Content Selector Panel in the Rich Content Editor. The Rich Content Editor and Content Selector Panel are available in Announcements, Assignments, Discussions, Pages, Quizzes, and Syllabus. Create your content in the Rich Content Editor. Place your cursor in the editor where you want the link to your file to appear. The Content Selector Panel should appear to the right of your editor (if you do not see the panel to the right, you may need to scroll to the bottom of the page). In the Content Selector Panel, click the "Files" tab. Under the Files tab, you will see structure of the folders and files that exist in your course's Files area. Within the Content Selector panel, find your file and click on it . A link to your file will be inserted in the editor where your cursor was placed . 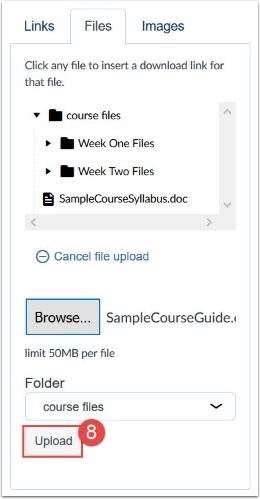 If you files is not yet located in the Files are of the course, you can Upload the file through the content selector panel. On the Files tab of the Content Selector Panel, click the "Upload a new file" link . 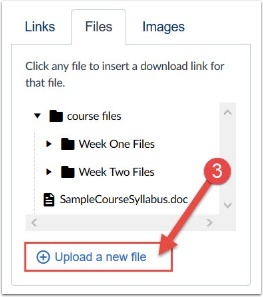 When you upload the file, it will go into your course's "Files" area. 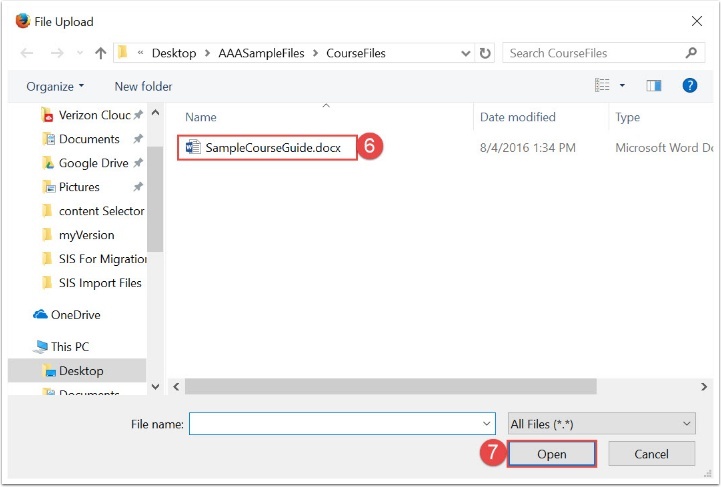 Select the folder in which you would like your new file to be uploaded to  (if you select "coruse files", the file will be uploaded in the main course folder). Click the "Browse" button . Navigate to and click on the file you want to insert . Click "Open" to select the file for upload . Click the "Upload" button . View your link in the Rich Content Editor. Your inserted links should appear where the cursor was located. 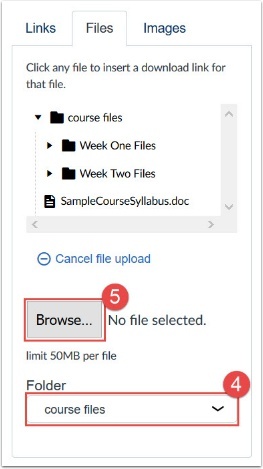 Click the "Save" button (or if you are in the Syllabus tool, click the "Update Syllabus" button). View your content and verify that your files are linked properly. If your document is supported, you click preview the file by clicking the Preview icon . Download the file by clicking on the file name or the pop-out icon .